See below for write ups from this week. Standing: Andy Ryan, Gareth Snook, Kevin Walsh, Stuart Lovey, Kevin Murphy, Darren Dummett, Steve Cobner, Anthony Jones, Mike Baldwin, Paul Ring, Steve Stewart, Gerard Powell, Mike Payne. Kneeling: Jason Brown, Darren Sage, Kevin Hurley, Brendan Walsh, Simon Harris (Capt. ), Tim Carless, Andrew Edwards, James Churcher, Stephen Matthews. Believe in divine intervention, do you? Well maybe not. But there are still some romantics from the parish of St Peter’s here in Cardiff who still insist they witnessed a miracle on the old Arms Park 20 years ago tomorrow. I Was There and still can’t be sure. But let’s face it, what happened on that Saturday, January 23, 1993, was not only the greatest upset in Welsh Cup rugby. It was the greatest upset in any kind of rugby, anywhere, period. And no game on that fabled turf could ever have ended in such dramatic, heart-stopping fashion. We’ll come to that but the memory echoing down the years is the sight of the match-end scoreboard: Cardiff 14, St Peter’s 16. Just two precious points, which is where the miracle comes in. It’s not usual for a trip down Memory Lane to infringe on the back page boys’ turf but this was no ordinary sporting event. This was an Event with a capital E.
But no-one predicted this in the bar of the Cardiff Athletic Club on the night before. Nope, the talk was all about how many points The World’s Greatest Rugby Club, as they still saw it, would win by. Even the most fervent Rocks’ supporters talked of defeat by less than 20 points as a moral victory. That word Rock is the giveaway. St Peter was the biblical Rock. So St Peter’s the Rocks, ever since being founded by a few sporting priests in Roath in 1886. Since then it had boasted of something of a special relationship with the Big Boys down the road. Over the years it had sent some graduates to the Arms Park, among them Jim Sullivan who, old timers used to declaim over a drink, was the greatest player who ever “went North” from Cardiff. He was the regular fullback at 16, a Barbarian at 17 and from 18 a Wigan hero for 25 years, scoring a world record 4,883 points. Anyway, when a telegram wishing the Rocks good luck arrived from the Vatican, no less, the talk in the pubs was that the Pope himself had offered his blessing, so how could the Rocks go wrong with God on our side? So there it was, Church as cheerleader, the game inevitably touted as David versus Goliath, although Goliath was a welterweight compared to Cardiff. What else, for this was mighty Cardiff, First Division leaders, Cup side of the Eighties with five wins from six finals, against St Peter’s, fourth from bottom of the Fourth Division. Yet at half time David was six points up. No problem, the Goliath fans chortled, watch the tries keep coming after the restart. And yes, a try arrived two minutes into the second half – but it came from St Peter’s flying wing Gareth Snook, converted by his outside-half Edwards. This was when Cardiff discovered that their own off-colour outside-half Lewis had suffered some sort of injury, although no-one else noticed. He limped theatrically off to be replaced by regular Number 10 Adrian Davies. It was a game-changer. Inside 10 minutes Davies kicked three penalties, one from Edwards, making it 16-9. And then, with minutes to go, Cardiff’s captain Mike Hall went over for the try that the home fans knew meant their Great Escape. So time running out, the score 16-14, a Cardiff conversion for a draw. Davies lined the ball up for what would surely be his fourth successful kick. It had to happen. To repeat, little Davids like St Peter’s just don’t beat Goliaths like Cardiff. Just 20 metres out. A couple of steps to the right. Then the run-up as Cardiff fans, knee deep in bitten-off fingernails, crossed what was left of those fingers and closed their eyes. Here was that proverbial breathless hush, then the sound of boot hitting ball and the roar, as fans on their feet watched it soar straight towards the posts. But the wind played one last capricious trick. It swept the ball a couple of inches wide of the post. St Peter’s had won because, some will swear, a large shimmering finger speared down from the clouds to flick the ball aside. Yes, there’s your miracle. Celebrated with Vat 69, what else? A likely story? Maybe not, but a good story. A month later Bonymaen knocked the Rocks out of the cup. One scribe observed that “The Lord, He giveth, the Lord, He taketh away.” But nothing can ever take away the memory of what really was a miracle witnessed 20 years ago tomorrow. It was one of the archetypal David and Goliath battles of Welsh sport. On one side was the mighty Cardiff RFC – table-toppers, serial cup champions, scorers of a century of points in their previous match. Boasting Welsh internationals Mike Hall, Simon Hill and Adrian Davies among their number, they were just two years away from an appearance in the Heineken Cup final. Facing them, were the tiny parish team of St Peter’s RFC – a collection of part-timers based in the capital’s suburb of Roath. And yet despite the incredible odds against the minnows, then positioned four positions off the bottom of lowly Division Four, today marks the 20 years to the day since one of the biggest upsets in Welsh club rugby history. Today, former players, coaches and supporters of St Peter’s RFC will mark the 20-year anniversary of their 16-14 victory in the Arms Park. A reunion dinner will follow on Friday where the likes of Paul Ring, who captained the team that day, will reminisce about his defining moment as a St Peter’s player. “Wherever I go people still talk about that game,” he said. “I was at a wedding recently and was introduced to people as someone who played that game. “One chap wanted to talk to me about it for hours. In Roath, Welsh Cup rugby’s greatest ever upset is still remembered with enthusiasm, though some details have since been embellished. 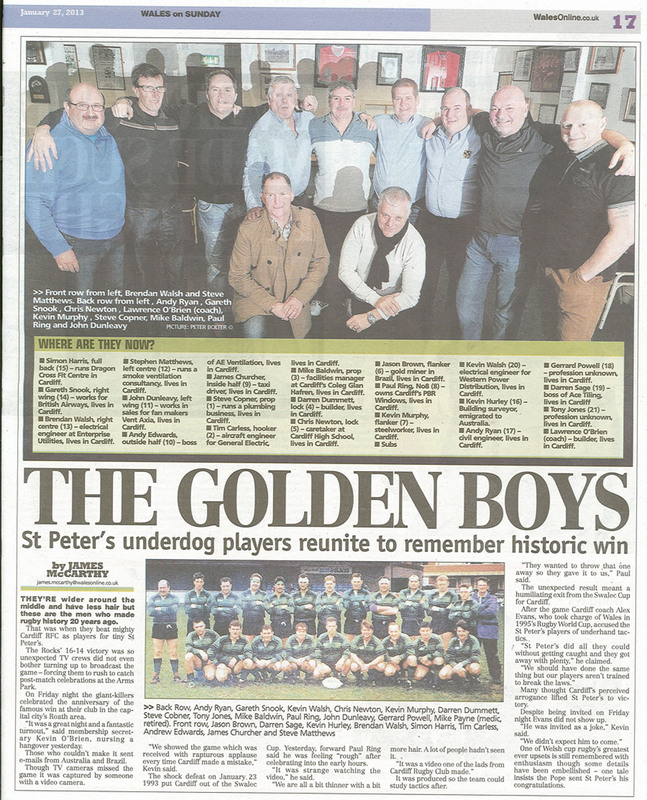 One story claims that the Pope himself sent St Peter’s RFC a letter of congratulations following their Swalec Cup victory over a team boasting Welsh capped players. “Actually it came from an old St Peter’s boy performing his priestly duties in Rome’s Vatican City, but why let the facts get in the way,” club membership secretary Kevin O’Brien said. Cardiff at the time were sitting on top of the First Division league table and had five wins in six Welsh Cup finals during a golden age for the club. St Peter’s were fourth from bottom in the Fourth Division. According to Mr O’Brien it was Cardiff’s perceived arrogance that lifted St Peter’s to victory. He said: “We had a double decker bus to take us two miles away to the Arms Park and the atmosphere was very subdued on that journey. “The hope was that we would do ourselves proud, and by that I mean losing by anything under 50 points. “The week before the game Cardiff had beaten Plymouth 107 points to three. “This was back in the days of manual scoreboards and when we turned up that day, the scoreboard at the Arms Park had three zero’s next to Cardiff’s name and only two next to ours. “We thought they were trying to undermine us. Mr Ring said: “We knew Cardiff would be fielding an under strength team, still an extremely talented side, but that gave us hope because we knew they weren’t used to playing alongside each other. He added: “And that scoreboard, with the three figures on it definitely gave us an extra push. “We knew we were in the game after just a few minutes. “Cardiff were awarded a penalty and opted to run the ball rather than kick for the posts. “For me it was a sign they weren’t going to play cup rugby. St Peter’s found themselves six points up at half time. Two minutes into the second half winger Gareth Snook touched down for the Roath side. It was only after Cardiff’s outside-half suffered a mysterious injury that the tide began to turn. Mr Ring said: “The last few minutes were tense, we were hanging on for dear life in the end. “Cardiff had brought on Welsh international Adrian Davies which was a suspicious move as tactical substitutions were illegal at the time, and replacements were only allowed for injury. “It was clearly a bending of the rules and Adrian started pulling the strings straight away. After the game Cardiff coach Alex Evans, who would later take charge of Wales in the 1995 Rugby World Cup accused St Peter’s of underhand tactics. But those sporting black and green colours in the Arms Park could not care less. Mr O’Brien said: “Our supporters were fantastic, it was one of the biggest crowds Cardiff has ever had. He added: “The game still means as much today, you ask anyone here about that day and they light up. Geraint Lewis who played outside half for Cardiff in the famous defeat and is now a school teacher at Rumney High School said: I dont remember too much about the game now its such a long time ago, and I suppose it was one to forget for us. But it was fantastic for St Peters, and its great that they are marking the anniversary. I wish them all the best and hope they have a good party, good on them. THE scoreboard operator at the Arms Park has a lot to answer for. As St Peters warmed up for what was expected to be a comfortable home win for Cardiff over their Third Division neighbours, the visiting players could not help but notice the digital socreboards at either end of the ground. They had Cardiff 000, St Peters 00, the St Peters coach, Laurence OBrien, said. I thought, you cheeky bastards. They may have scored 107 points against Plymouth Albion, but they certainly werent going to do that against us. OBrien was quite right, his side going on to record the most famous victory in the 23-year history of the Welsh Rugby Union Challenge Cup, now known as the Swalec Cup, by beating Cardiff 16-14 in what was the home sides 100th tie. Winners five times and finalists on three further occasions, Cardiff should have known better than to gamble with selection for a one-off occasion by playing only four first-team regulars. As soon as we heard the Cardiff team we felt there was a possibility of us winning. That gave us quite a boost, Simon Harris, the St Peters captain and full-back, said. It was always going to be a game that Cardiff werent going to take seriously. They underestimated us and we had the last word. Were one of the few clubs left at which the players dont get anything for playing. Were paying to play. I dont care how much money some teams are offered in bonuses, you cant buy success or memories like beating Cardiff. If Cardiffs team selection was the first boost of confidence for Harris and his team, there was another in the second half when the home side made what appeared to be a blatant tactical substitution by replacing the out-of-sorts Geraint Lewis with Adrain Davies, leading scorer in the Heineken League, at outside-half. Davies kicked three penalties but failed to convert Mike Halls 77th-minute try which would have taken the game into extra time, while his last-ditch penalty attempt would have won Cardiff the game had he succeeded. But rather than worry about the controversial appearance of Davies, St Peters took it as a sign that Cardiff were panicking. As for Cardiff, who had averaged 54 points a game in their last six matches, they targeted the referee, John Groves, as an escape route. Ill probably get shot for saying it, but you cant have a pounds 5 referee in a pounds 20,000 competition, Alex Evans, the Cardiff coach, said. I cant say much without being critical of the referee. St Peters did all they could without getting caught and they got away with plenty. We should have done the same thing but our players arent trained to break the laws. 20-10, while the holders, Llanelli, were six points adrift at Kenfig Hill before three tries brought them a 17-6 win. Newport survived at Pontypool United 10-0, while Bridgend ran out 12-0 victors at Fleur de Lys. It was all close stuff, but nothing as dramatic as at the Arms Park.